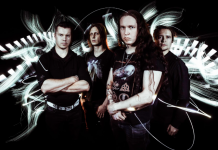 Let’s begin with by laying the facts on the table: the Kotka-based TOTO-core-unit, Omnium Gatherum, is by far the finest melodic death metal band in this country. The band, led by Markus Vanhala, nowadays also of Insomnium fame, still doesn’t quite enjoy the type of success they would easily be entitled to, even though their material has a huge deal of substance to offer, also to people not usually acquainted with metal, and they’ve already released seven full-length albums since their inception, spanning over two decades. OG threw a one-off show at Virgin Oil Co. on March 17th, 2017, in an almost traditional fashion, since this was probably the third show performed in the same venue during early spring time. Over the years that I’ve attended shows at Virgin Oil and I’ve become accustomed to the fact that the club upstairs opens at 22:00, which led to a huge bummer straight off the bat – as I arrived at the venue at about 22:30, Oceanwake, the evening’s opening act, was already nearing the end of their warm-up slot – apparently the doors had already opened at 21:00. I don’t know if I wasn’t the only one to get mixed up, since I had to brush my eyes as I arrived – the front of the stage was completely empty, and Oceanwake had to play their doom/post-metal songs to people sitting at the tables on the other side of the space. The Luvia-based band, having released their third album, Earthen, only a week before, wasn’t familiar to me beforehand, but the short while that I got to listen to their material, reminiscent of acts like ISIS or Callisto, felt hugely appealing. The stage was decorated with eye-catching roll-ups and the light technician had orthodoxly left the front spotlights off. I think I’ll have to correct my mistake and attend the next show in town! During the intermission, the venue started to fill with people, but one couldn’t speak of a rush – where was everybody? As OG’s intro tape began playing at 23:00, the front of the stage was still only halfway full. As with previous shows after the release of their latest record, Grey Heavens, the band kicked things off with “The Pit”, instantly picking the audience up. In a way, I would’ve hoped for something different for the first song, since I knew that the stage sound would be pretty awful for the first 5 minutes – the drums were mushy and Jukka Pelkonen’s microphone was way too quiet. As “Skyline” was played second, the situation was already fixed, and the sound was decent for the remainder of the set. Speaking of Pelkonen, I’ve probably said this before, but one cannot find a more sympathetic frontman in the Finnish metal scene. The man is always smiling, downright demanding people to mosh along their songs – the shy Finns often get confused as Pelkonen points them out individually, asking them to participate more. As usual, the setlist favored the moshers, since even the songs that could be considered ballads aren’t exactly slow, and Pelkonen didn’t waste time with his speeches, retaining the intensity. And speaking of the setlist, it had experienced a facelift since last summer. Omnium Gatherum has enjoyed their wider conspicuousness from The Redshift (2008) onward, and the set didn’t feature material older than this, but since last year, the focus had shifted from Grey Heavens and towards Beyond (2013) and New World Shadows (2011), with each record being featured with four songs, leaving The Redshift with two: “Nail” and “Chameleon Skin.” Having followed the band’s doings for over a decade, I’ll always yearn for more obscure choices like “Dysnomia”, “The Fall Went Right Through Here”, or “The Perfumed Garden”, but I shouldn’t complain, since both “Soul Journeys” and the final song, “Deep Cold”, haven’t been included in a while. OG has, for a good while already, been past the point in which the set could be randomly picked and still contain only hits and nothing else. And “New Dynamic”… how good can a rock’n’roll song even be! In terms of musicianship, the band doesn’t need any introduction – everyone is, in their trade, top-of-the-line in Finland: Markus Vanhala has been one of our most creative guitarists, and as usual, his cooperation with Joonas Koto (guitar) worked flawlessly. The bassist, Erkki Silvennoinen, played his parts modestly as always, but once again, completely biased as I am, I’ll have to hand out the Virtuoso of the Evening award to the drummer, Tuomo Latvala. Originally loaned from Torture Killer last year, but having been made a full-time member afterwards, Latvala’s beats are always different, as he invents new fills for older songs on the fly, and by the looks of it, both his hands seem to be equally dominant, as he leads with his left hand half the time. 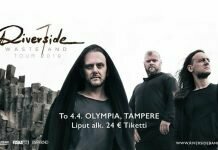 All-in-all, Omnium Gatherum threw a successful show, and the only thing that bugged me, was the low head count of the audience – the 14€ ticket price could’ve been the cause. Maybe everyone was at Tavastia, ironically watching the Sum41 show?